Competenz recently hosted students from Manukau Institute of Technology (MIT) and Unitec Institute of Technology (Unitec) as part of the Māori and Pasifika Trades Training Initiative. At the event, held at the MIT Otara campus, welding, fabrication and air conditioning students heard from the Competenz careers team and Competenz account managers on how they can transition from being a student, to an apprentice. Competenz Māori and Pasifika Manager Iani Nemani says students need to be confident in making the first step into a trades career. “In the next six months these students will be completing their qualifications,” Iani says. Competenz account manager Reg Currin, who spoke at the event, believes students need to have a passion and drive to succeed. “We can give them the tools and information, but at the end of the day, they determine their own destiny,” Reg says. In the afternoon, students were split into groups and sent on ‘discovery tours’ with three local businesses to experience what it’s like to work in an engineering or air conditioning company. One of these companies, Grayson Engineering based in Wiri, opened their factory to eight MIT welding students. Grayson Engineering General Manager David Moore says if the students are willing to learn, the opportunities are there. “You’ve got to have the right attitude and be dedicated to your work. If you know how to read technical drawings in welding it shows versatility which is a huge advantage,” David says. MIT student Alimoni Filihia, who’s currently studying level 3 welding, was interested in the opportunities Grayson’s had to offer. “I’ve never been in an engineering factory before so it was a great opportunity to do this tour. I’ve done a lot of labourer jobs in the past. Working in engineering is definitely something I want to get into,” Alimoni says. 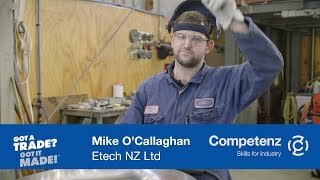 The Māori and Pasifika Trades Training: Auckland Initiative currently has around 400 students who are supported by industry training organisations (ITOs) like Competenz, polytechnics and industry into a career in trades.